Lil Wayne penned a tribute to the star. Time's 100 Most Influential People issue comes with six different covers featuring Mark Zuckerberg and Priscilla Chan, Leonardo DiCaprio, Lin-Manuel Miranda, Christine Lagarde, Priyanka Chopra, and Nicki Minaj. 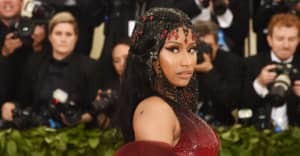 Time drafted Nicki's friend and frequent collaborator Lil Wayne to help explain her importance. "When I heard the first two and four bars, it wasn't even about her rapping better than any female rapper," he remembers. "It was about, man, she's rapping better than other rappers—period." "She's reached far beyond everything I would have imagined," he continued. "She's so influential and doing all the right things. She's an icon, a boss and a role model to all these young girls out here on how to do it the right way. Her work ethic speaks volumes and has yielded these results. The scary thing is she’s still going. Ha! Nicki Minaj will go down as one of the best to do it in the history of music." Other notable entries from the worlds of music and TV made it onto the top influencers list, including Adele, Idris Elba, Taraji P. Henson, and Kendrick Lamar. Check out the full package here.